Much as I don't like appearing on video I do like web based video tools and Plank.ly is one that caught my eye recently. 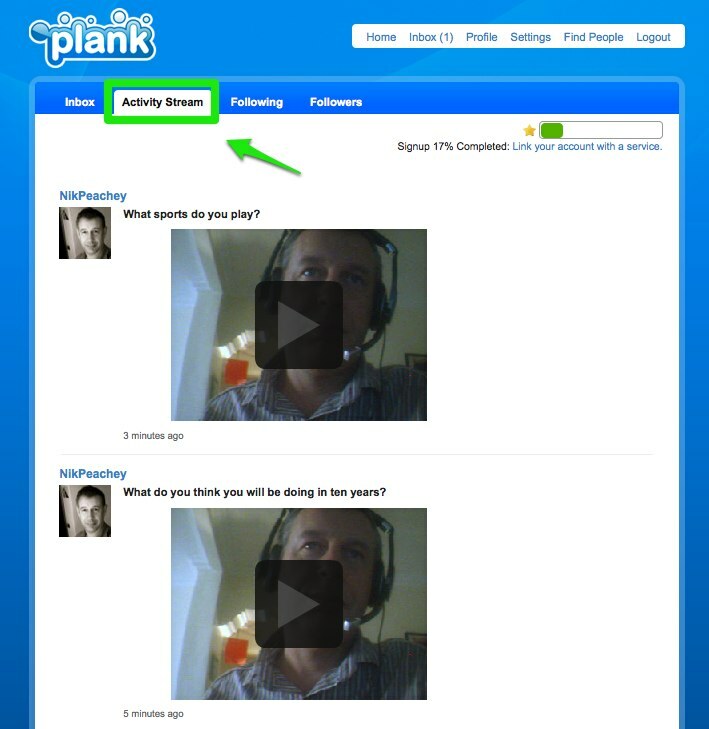 Plank.ly is an asynchronous Q&A site which allows users to ask and answer each other's questions either by text or video. 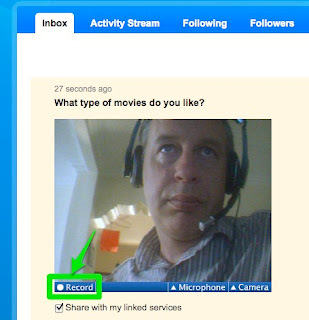 It's very easy to use, you just need a webcam and to set up your account. Once you have done that you can integrate it with Twitter or Facebook (though I would advise that you wait to see how useful it is first) and you can start inviting friends or students to follow you and invite them to leave questions for you. 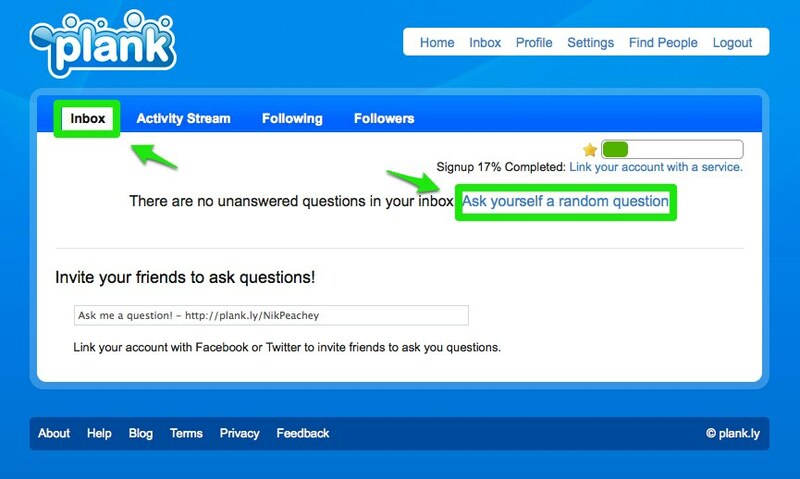 It's a good idea to get started by getting Plank.ly to ask you a few random questions, so that when visitors come there is something for them to see. This is very simple to do. 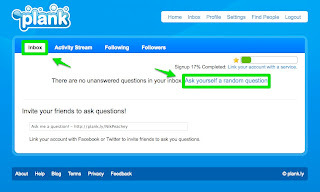 Once you have created your account, go to the 'Inbox' and click on 'Ask yourself a random question'. 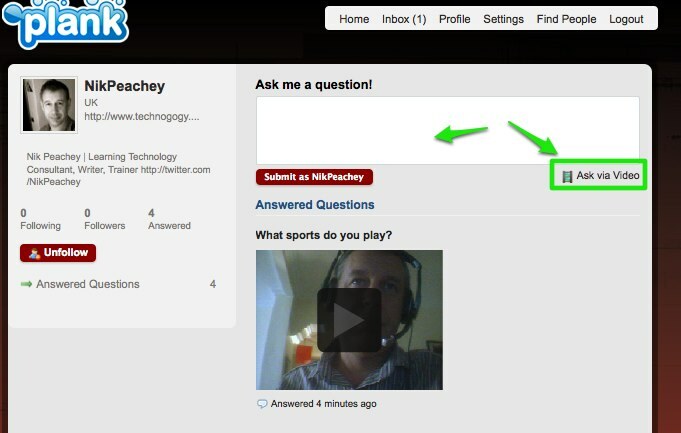 Once the questions appears, you can answer it either using text or video, just by clicking the icon on the right. Clicking the video icon will launch the video recorder window. You'll need to click on 'Allow' so that the Flash plug in can access your camera and microphone. 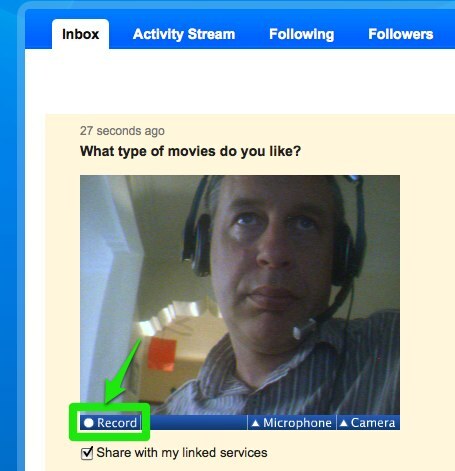 Then you just click on 'Record' and start recording your answer to the question. You can try again if you don't get it right first time so don't worry too much. If you like your recording, just click on 'Use' . 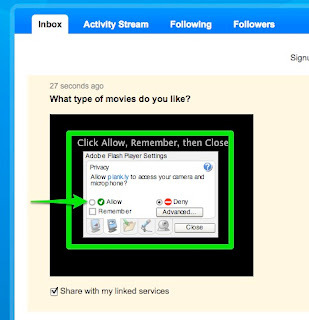 All of your video answers are collected in your 'Activity stream'so you can go back and edit or delete them later. 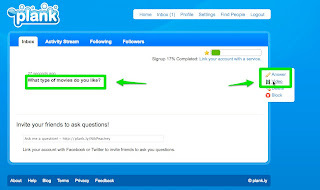 The activity stream is a little like Twitter in that you can start to follow people or they can follow you, so you can start asking and answering each other's questions and see what questions other people have been asked. 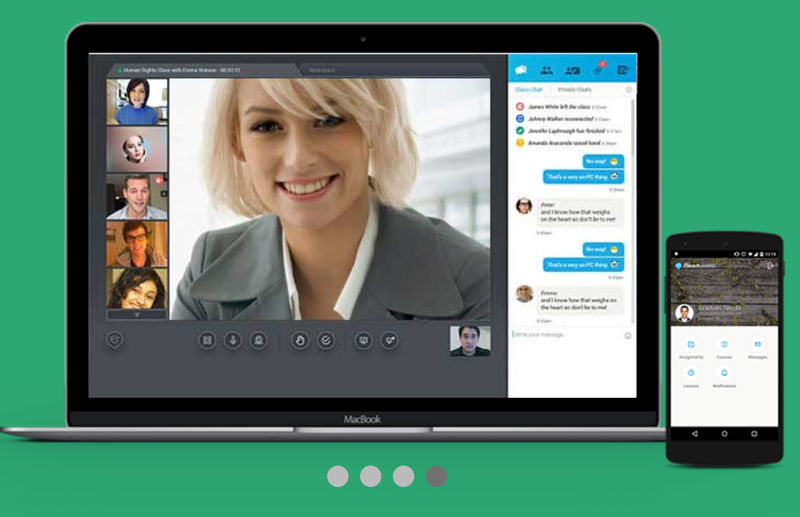 I think this is a great 'ice-breaker' especially for an online class where students don't really get to meet each other and are often working in different time zones. It's also a great way for lower levels to get some online speaking practice for homework and the fact that they record their answers will be interesting when they come to look back on their progress. Also great for you to help assess their progress too. It's also a nice way for new classes to get to know you as their teacher. This can be really difficult in bigger classes with lots of students, so this can add a nice element of 1 - 1 contact. Questions and answers are the fundamental building blocks of language, so this is a great tool for checking out students' grammar and their ability to formulate questions and answers in any particular tense, so great online controlled speaking practice too. This is an open site, so students can be 'found' by other people, so think about what age groups you use the site with. If you are following the students, however, you will be able to see who they are interacting with and as all accounts are registered you will be able to track back any bullying or abuse that may happen. Thanks for another great tip. It seems that you really check out a tool before you blog about it, much appreciated! Keep up the good work.